The first non-magnetic lithium polymer battery! 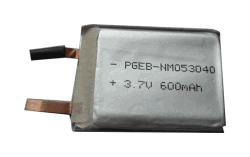 Up to now lithium polymer batteries have contain a considerable amount of nickel foil, which is ferromagnetic. PowerStream has been working with a team of engineers in China to develop the first lithium ion battery that is completely non-magnetic. The result is a cell using new materials, and having copper leads. This battery is intended for use in applications that are sensitive to magnetism, such as magnetometers and equipment used in MRI rooms. Non-magnetic Lithium Polymer Cells. We have a limited variety of cells at the moment, but we can make other sizes with a minimum order of 1500 cells. Two versions of my data logger that both use the 250 mAh battery (PGEB-NM651825 ) without the protective PCB has been formally safety tested by an MRI safety testing company for deflection angle and torque, a lighter shorter version that does not have a titanium capsule, just screening, and the larger version with the titanium capsule, both insulated on the outside. No issues were found for deflection angle or torque. The deflection angle in both cases was a negligible 3 -3.5°, confirming the qualitative test I did here myself.